Delicious peach jam spiced up with vanilla, white rum and some thyme for added zing. Very easy to make and success guaranteed, everyone will love it! In my childhood both my grandma and my mom regularly made jam and canned. Every year in the summer there were weeks they brought home baskets full of fruits (apricot, strawberry, sour cherry, cherry, plum, blackberry, etc.) and then made jam with it. With my sisters we loved to help and we all had our favourites. Apricot was one we all loved (and I was very partial to raspberry), but somehow I can’t recall that we were crazy about peach jam. My mom didn’t even make it, we only got a few jars from my grandma. 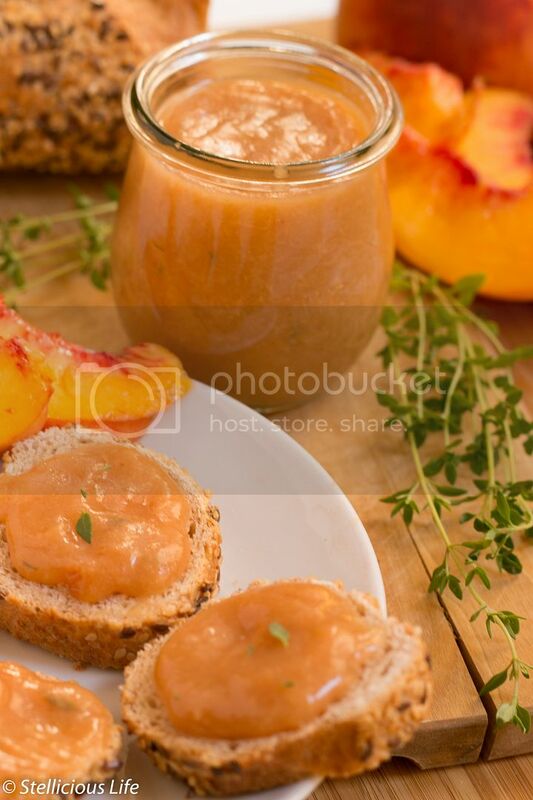 So this year when I spied some fresh and wonderful smelling peaches at the farmers’ market I knew I wanted to experiment and had no doubt that I could create a delicious peach jam recipe. Well I did, and once again, after Boyfriend and the family gobbled it up I can say it was a success! I even gifted some jars to grandparents and friends as they make a lovely homemade and special gift, just put the jam in nice little jars and decorate them, I’m sure they will love it! The recipe is very easy and you can have your jam within the hour. So let’s get to it and let me know if you try it. In a bigger pot boil water and put the peaches in the boiling water for 2-4 minutes. Take out the peaches and carefully peel them (you may want to wait for them to cool a bit). In a saucepan mix together the halved and sliced peaches, the sugar, lemon juice, vanilla extract and thyme, and cook on low heat until the peach softens. Add in the white rum and while stirring boil it for another minute. Take it off your stove and with an immersion blender blend until there are no more peach chunks. Pour into sterilized jars, screw the lids on tight and put them upside down on a tray. After 5-10 minutes turn them over and let them cool. 1. I prefer my jam not to be too sweet and have the taste of fruit be dominant, but while cooking, taste the jam and if you find it not sweet enough add some more sugar. 2. If you use dried thyme use much less as their scent is more powerful than the fresh ones. An extraordinary spin on the original strawberry jam: infuse your strawberries with the irresistible scent of elderflower or lavender, or complement the sweetness of strawberries with the tartness of rhubarb. Three kinds of strawberry jams all very different but equally delicious, not to be missed!